Hello and welcome to the September edition of RISA News. This edition contains updates on everything we have been doing since May! That includes an update from our June AGM, what our busy advocacy committee has in store for RISA over the next 12 months, and new articles. It also contains, as always, personal stories and recipes. We are on Facebook! The RISA Facebook private members page is very busy which is great to see that so many of our members are posting and responding to each other. If you would like to be added to the private Facebook page please email us at [email protected]. Also, if your Facebook name is different to your RISA membership name, just pop that info into the email as well! Just a reminder that our reflux forums are, as always, up and running and if you have a chance to log in and put a post up that would be great. We know that not all of our RISA members are on Facebook and want to make sure that we can all “meet” to continue to give each other the wonderful support and sharing of info that is so essential to surviving this reflux roller coaster! Please email us at [email protected] if you can’t remember your log in details and we will happily email them to you! RISA held our annual AGM in June and there are a few changes to our management and advocacy committees as we have some new wonderful volunteers. A complete run down on who’s who can be found here. Our advocacy committee have met already since the AGM and have started planning our Sydney conference in 2014! We have received such wonderful feedback from our 2013 conference that we are doing it again!! Our advocacy committee members have also been busy applying for grant applications to help us to support you and raise awareness of GORD in our community. We were successful in the Grill’d Local Matters program (they donate $100, $200 or $300 to local groups each month) and $300 from Grill’d Fortitude Valley is coming our way which is just fantastic! So a big thank you to Grill’d at Fortitude Valley and any of our Brisbane RISA members who went to Grill’d bought a burger and voted for us! Late August was Speech Pathology Week (25 – 31 August) & the theme was “Start the conversation”. RISA started the conversation about reflux, feeding problems & how speech pathology can help. We invited a Speech Pathologist to answer your feeding questions on Facebook. It was hugely successful and a bit of a whirlwind but well worth scrolling back through our posts to see some of their valuable advice and information sheets. Did you know that at this moment 1.1 million Australians (5%) have trouble eating or swallowing food or drink? Babies & children with reflux are affected by feeding problems much more commonly than this. We have RISA products for sale!! We are selling custom made, limited edition “Spit Happens” Fundraising Mugs! For those of you with a sense of humour about the less glorious moments of our reflux parenting lives, the mugs are available for $15 + postage. 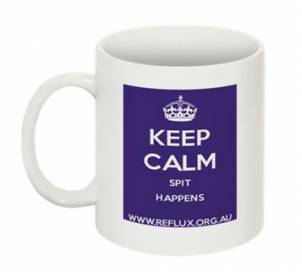 We also have a special deal at the moment, a “Spit Happens” Mug and a copy of Reflux Reality for $35 + postage. More info can be found on our Products page. We went to the Brisbane Pregnancy & Baby Expo and the Sydney Pregnancy & Baby Expo! This was wonderful exposure for RISA and we had a number of parents come to talk to us, take brochures and information and even found a few new RISA volunteers! Thank you so much to all the RISA volunteers who gave their time and made it happen! Thank you Jess Donaldson, Fran Graham, Tania Deller, Celina Wood, Nicki Lee, Chrissy Nash, Marina Cassin, Jess Tovey, Jo Matthews, Anna Potts, Lauren Calvert, Bel Salter, Erin Johnson, and Rebecca Chan Davis. A big thank you to our President Jo Matthews who attended the International Paediatrician’s conference on behalf of the Association for the Wellbeing of Children in Healthcare and RISA. Our amazing President Jo presented to 30 to 40 paediatricians about the rights of children in healthcare, in particular Jo spoke about the right of every child and young person to express their views, be heard and taken seriously and how health care professionals can listen to young children BY listening to parents! Read her presentation here. Another big thank you goes to our RISA member Alex Ingram who attended the Bendigo Child Health “Early Arrivals” Conference (Focus on Premature Babies) in Bendigo on Friday 30th August on behalf of RISA Inc. Forward this newsletter to people who might have a new baby. Tell a midwife or a nurse. Take RISA brochures to your local GP/medical centre (please email us at [email protected] and we can post some brochures to you!). Join in the chat on our forums or on Facebook. Letter to “family and friends”. If you’d like to contribute to our newsletter or provide us with feedback, please email [email protected].